The Manley Stereo Variable Mu® T-Bar Modification — Manley Laboratories, Inc.
PURPOSE: To provide a replacement for the obsolete 6386 tubes in earlier Manley Variable Mu® units or convert later 5670 units to have the same limiting characteristics of the original 6386 for smoother operation. METHOD: To install a converter board and surrounding modifications to enable usage of two 12BA6 or 6BA6 single pentodes wired in triode mode to take over the duties of a single envelope dual triode 6386 or 5670 (per channel). UNITS AFFECTED: Serial numbers for units that will benefit from this update are (all). See the Version Identification page for more info. INTRODUCTION: The Manley Variable Mu® has been in production for some years now and has become an indispensable tool in studios since its inception. 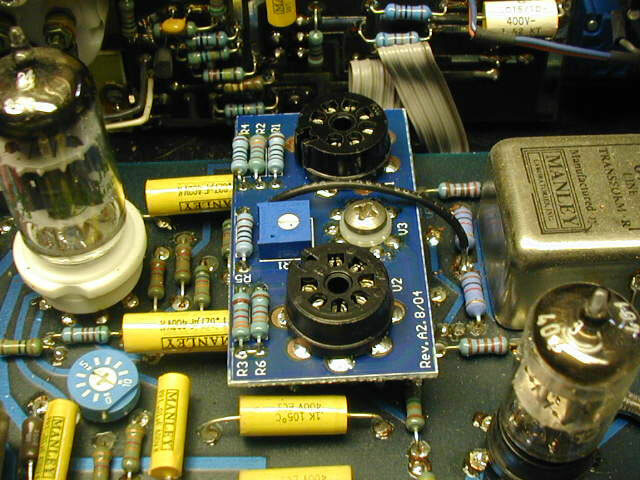 These units operate on the same principle as several top-notch vintage tube limiters, and the original Manley version indeed used the same 6386 input tube as the Fairchild, Gates, and others. This tube is the one that actually performs the gain reduction; it, more than any other component, determines the sonic signature of these units. HISTORY: The 6386 dual triode was designed as a cascode RF/IF gain-controlled amplifier, and as such, had many characteristics ideally suited for use as a gain-controlled audio amplifier. However, it seems this tube was used more in commercial/industrial applications rather than high volume consumer applications (like in radios and TV's). Also, it appears that none of these have been manufactured in recent years. The combination of these two factors means that present supplies of 6386 tubes are quite limited, expensive, and in many cases unusable due to poor matching, high noise, or microphonics (which may not have been issues for the tube's original intended use). Manley decided in June of 1996 to begin using a type 5670 dual triode which were similar, importantly sharing the same pin-out as the 6386 and available in sufficient quantities to allow for testing and matching. ENTER NEW TUBE TYPES: The 5670 equipped Variable Mu's were well received, and retained many of the characteristics that made the original version of the Variable Mu® popular. They did sound different than the original, especially when pushed past 6db or so of limiting. Even though some people even preferred the new version with the 5670, it was felt that it would be worthwhile to give the users the ability to return to the traditional sound without resorting to use of an esoteric (or unavailable) tube. We also wanted to furnish an alternative replacement for the 6386 in older units. The goal was to find a tube that was 1) nearly identical to the 6386 in performance 2) manufactured (or being manufactured) in large quantities 3) able to be retrofitted into existing units (in the field, if at all possible). This was a tall order, as other available remote-cutoff dual triodes (such as the 6BC8 and 6ES8) are not close enough in characteristics to be used as a direct replacement. Enter the 12BA6, which is a remote-cutoff single pentode. Wired as a triode, this tube has characteristics very close to the 6386 as confirmed by a Tektronix 570 curve tracer, and by A-B listening tests. These tubes were manufactured in large quantities for use as gain-controlled IF amplifiers in common radio receivers. The hitch: the 6BA6 (or 12BA6) is a single-section tube; the 6386 is a dual! ENTER THE ADAPTER BOARD: So why not use two 12BA6 tubes to replace one 6386? There is enough room inside the unit to accommodate two tubes; the pair will directly replace a 6386 in an older unit or a 5670 in a newer unit with only minor modifications. The other advantage to this approach is that the tubes can be tested and installed as a matched pair. We have numerous examples of 6386's where the two triode sections inside do not match each other within a usable range and there is nothing we can do about it because the two triode halves are locked inside the bottle. So what we did was to design a 1"x 2" circuit board that has two sockets for the 6BA6 or 12BA6 tubes ("6" or "12" depending on the heater voltage) that plug in where the original tube went. Of special importance in using two single element tubes to replace a dual element tube is the ability to match and select very well matched tubes not only for each channel's two phase-halves, but also for both channels. This factor alone, especially when considering that there are really no decent 6386 tubes left, allows the "T-Bar Mod" units' performance to easily exceed the older units. There are four major versions of the stereo Variable Mu® that have been built since 1994, and consequently three different versions of the adapter boards. Refer to the Identifying the Different Versions of the Variable Mu® page for specific details as to which board you'll need. INSTALLATION: Version 1 adapter boards require no modifications to the existing circuitry, only re-calibration. Versions 2, 3, and 4 require minor circuit modifications as well as re-calibration. Instructions for Version 4 units can be found here. We can perform the installation at our Manley Service Center for a nominal charge, or it can be done by a technician familiar with repair and modification of audio gear under our direction. An audio signal generator and AC voltmeter are also required to calibrate the unit. Reading the "Installation Instructions" will give you an idea of the work involved for the different units. SOUND COMPARISON: In direct A-B comparisons, the 6BA6/12BA6 version sounds nearly identical to the 6386. Comparing to the 5670, the 6BA6/12BA6 sounds less "squashed" as the amount of limiting is increased; consequently, it is possible to obtain more limiting with fewer artifacts than before. Performance at faster attack times is enhanced as the 6BA6/12BA6 tubes can be better matched than before with the dual-triode tubes. COST AND TURNAROUND TIME: The conversion kit installation can be done by Paul Fargo in our Arizona Service Center for $500 plus shipping, and includes all necessary parts and labor plus re-testing and calibration. This usually takes 2-5 days depending on existing workload. It is recommended to schedule in advance with Paul for fastest turnaround. We can also supply just the kit with installation instructions for $300 plus shipping (and sales tax as necessary) for installation in the field by a qualified technician.